Three weeks ago, archaeologists in Egypt found a massive black granite sarcophagus in Alexandria, untouched for 2,000 years - and fleet-footed rumour quickly got to work. Could it contain the remains of ancient Greek leader Alexander the Great, or (less appealingly) a deadly curse? According to experts who have now unsealed it, it's a no to both. Instead, it revealed three skeletons and red-brown sewage water, which gave off an unbearable stench. Egypt's Ministry of Antiquities had appointed a committee of archaeologists to open the relic, which was unearthed at a construction site. According to Egyptian news outlet El-Watan, they initially lifted the lid of the tomb by just 5cm (2 inches) before the pungent smell forced them from the inspection scene entirely. They later prised it open with help from Egyptian military engineers. "We found the bones of three people, in what looks like a family burial... Unfortunately the mummies inside were not in the best condition and only the bones remain," said Mostafa Waziri, secretary-general of the Supreme Council of Antiquities. Addressing media fears that disturbing the tomb could trigger an implacable Pharaoh's curse, Mr Waziri declared: "We've opened it and, thank God, the world has not fallen into darkness. "I was the first to put my whole head inside the sarcophagus... and here I stand before you ... I am fine." Where does the legend of the mummy come from? Despite that, the site has now been cleared of people amid fears the sarcophagus could release lethal toxic fumes, Egypt's state-owned newspaper Al-Ahram says. Scientists have debunked the infamous "Mummy's Curse", but are there other threats in ancient tombs? Lord Carnarvon, financial backer of the excavation of Tutankhamun's burial site, died from an infected mosquito bite shortly after they opened the chamber in 1923. Since then, rumours have swirled that mould or bacteria survived in the sealed area and caused or contributed to his fate. But F DeWolfe Miller, professor of epidemiology at the University of Hawaii, told National Geographic that there's no real danger. "We don't know of even a single case of either an archaeologist or a tourist experiencing any negative consequences [from bacteria or tomb moulds]," he told the magazine. Experts have said the three individuals in the Alexandria sarcophagus may have been soldiers in the time of the Pharaohs. The skull of one is said to show cracks which point to an arrow injury. An alabaster bust, its features weathered beyond recognition, was also found with the tomb. The structure is almost two metres (6.5ft) high and three metres long, and is the largest of its kind ever found intact. It weighs in at 27 tonnes (59,500lb), and is believed to date from the early Ptolemaic period, which began in 323 BC after the death of Alexander the Great. Archaeologists will now study the sarcophagus in depth to pinpoint when its occupants lived, and how they died. 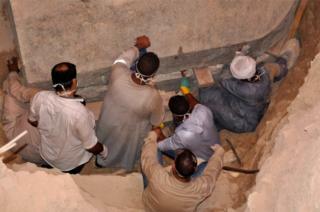 The contents of a mysterious giant-sized coffin discovered in Alexandria have finally been revealed. Measuring a whopping 9ft long, 5ft wide and 6ft tall, the casket, which was unearthed at a building site following a preliminary inspection by a team from Egypt's antiquities ministry, dates back around 2,000 years and is the largest sarcophagus ever discovered in the city. After it was first revealed, there was much speculation and debate over what was inside with some suggesting that it may even contain the remains of Alexander the Great himself. Now though, after finally lifting the lid, archaeologists have revealed that the sarcophagus actually contains the remains of three human skeletons submerged in disgusting sewer water. The smell was so bad that after the lid was lifted even slightly, the operation had to be postponed. "We found the bones of three people, in what looks like a family burial," said Mostafa Waziri, secretary-general of the Supreme Council of Antiquities. "Unfortunately the mummies inside were not in the best condition and only the bones remain." Before it was opened, some had warned that the contents of the casket may be cursed. "We've opened it and, thank God, the world has not fallen into darkness," said Waziri. "I was the first to put my whole head inside the sarcophagus... and here I stand before you... I am fine."